Turkey, the most eastern of all European countries and the most western of all Oriental nations, contains more traces of classical antiquity than almost any other country in the Mediterranean. Throughout its long history Turkey has been a meeting point of East and West. Countless civilizations, including the Hittites, Greeks, Romans, Byzantines and Turks, have left their mark, creating a historic legacy of amazing richness. Many of the major sites of early Christian history, such as Antioch, and the great church of Hagia Sophia, can be found in Turkey. The mosques, palaces, bazaars, and the caravanserais (resting place for travelers from the east) of the Seljuk and Ottoman Turks add an oriental ingredient to this fascinating cultural mix. The landscape is immensely varied, from the softly rolling farmlands of the northwest to the sunny Mediterranean south, from the bleak, treeless highlands of the east to the rainforests of the Black Sea mountains. Some of the least spoiled beaches of the Mediterranean are found along Turkey's southern shores. "And when Paul and Barnabas had spoken the word at Perga, they went down to Attalia; and from there they sailed to Antioch." As this passage from the Bible (Acts 14:25-26) shows, Attalia, now called Antalya, has been a port of call for a long time. In recent decades Antalya has taken on new importance as the principal city of the Turkish Riviera, the country's most popular summer holiday destination, with nearly 120 kilometers (75 miles) of sandy Mediterranean beaches. Luxury hotels and holiday villages, catering mainly to European visitors, now crowd the resort towns. The Turkish Riviera has sunshine 300 days a year, and the countryside is a place of olive and citrus groves, palm, avocado and banana plantations. It's also great for swimming, wind-surfing, water-skiing, sailing, mountain climbing and caving. If you come in March or April, you can snow ski in the morning and swim in the Mediterranean in the afternoon. Incirlik, site of a large US Air Force base with a full range of facilities, lies about 30 miles inland from the Mediterranean port of Mersin. 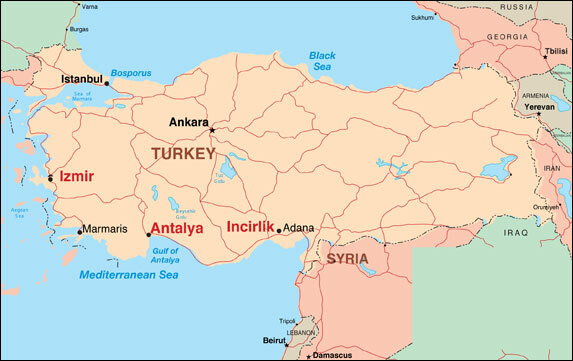 The U.S. base is just outside Adana, Turkey's fourth largest city and the center of a rich area of agriculture and textiles, the products of which are shipped through Mersin. A local specialty of the area is the Adana kebap, a sensationally seasoned sausage. A good destination for excursions is the Seyhan Lake, which offers shady walks in a eucalyptus forest and a good range of restaurants and tearooms. The region has seen many invasions, lying as it does at the foot of the Taurus Mountains facing the Syrian plains. Though there is no U.S. base in Izmir, a large American military community lives and works alongside the Turkish population. Currently, Izmir is a 12-month unaccompanied assignment. The functions include a commissary, an exchange, two shoppettes and several concession stores. Only a few miles out from the air station is Bayrakli Park, a complete recreation complex with a swimming pool, indoor racquetball court, outdoor basketball and tennis courts as well as football, soccer and baseball fields. Izmir is the third largest city in Turkey, with a population of more than four million. One of Turkey's major seaports, second only to Istanbul, Izmir is a major outlet for a rich agricultural region where much of Turkey's tobacco and fruits are grown. Izmir's bazaar is situated to the northeast of Konak Square extending through a maze of narrow streets and lanes with innumerable workshops, little shops and stalls and a number of small mosques. 7 hours later than the East Coast U.S.